Do you love working with computers, software, databases, and technology in general? You can turn your interest in technology into a career – but only if you have a degree. A degree in information technology, or IT, gives you exactly what you need to start a new job and move into this growing field. If you’re interested in a career in technology, here’s why there’s no better place to start than earning your IT degree online. An IT degree will open the door to jobs in information technology – or, as it’s sometimes called, information systems. You’ll study everything about the field, learning programming, databases, and other computer-related concepts and skills. By the end of your degree program, you’ll have plenty of technical and theoretical experience and be prepared for any job in the IT field. And, of course, if you’re going to work in IT, there’s no better way to study and earn your degree than by doing the work online. Online degrees have plenty of benefits and can easily set you up for success. The most important and beneficial reason to earn your degree via an online college or IT degree program? It’s significantly cheaper than attending a traditional college. According to EdSmart.org1, you can earn your degree for just a few thousand dollars – there are colleges that offer online degree programs for a tuition price of just $2,805 and $3,830. And these programs are accredited, making them reputable and able to provide you with the exact same quality as a traditional on-campus program. Compare those affordable tuition rates with the cost of tuition at a traditional college, and you’ll quickly discover just how significant the savings can be. In addition to saving money on tuition, you’ll also save on other educational expenses when you’re studying online. As Illinois Online2 notes, you won’t have to pay for textbooks, on-campus fees like activities or health fees, housing that can total $10,000 or more, or even transportation to commute to classes. You’ll put yourself ahead of your peers financially when you earn your IT degree online. You won’t have to invest tens of thousands of dollars in your studies, helping you to study without worry. If the idea of sitting in a classroom or lecture hall while trying to learn important IT concepts from an instructor sounds frustrating or outright dull to you, there’s good news: you don’t need to learn in the same environment of a traditional classroom. When you choose to earn your IT degree online, you get to choose your very own learning environment. When you take classes online, you’re free to study absolutely anywhere – from your kitchen, your local library, your favorite coffee shop. Anywhere you’re comfortable is perfect for your online courses and homework. As long as you have an internet connection, you’ll be able to access your courses and lecture materials. This flexible, comfortable setup makes it easy to learn on your own schedule too. Many online programs offer courses that can be accessed at any time, freeing you up to fit your studies in your work day or busy life. This unique structure will make it even easier to complete your degree whenever you have the time. Once you’ve earned your IT degree, you’ll have the credentials, the knowledge, and the skills you need to start a career in the information technology field. This huge field, which is growing as technology changes and expands, offers so many different opportunities and possibilities that you’ll be able to pursue – and find – a job that excites you and pays you to do what you enjoy. Network Engineer: A network engineer oversees and manages a company’s computer network, helping to troubleshoot and fix any issues and keep the network strong. These professionals make around $71,0003 a year. Database Administrator: A database administrator is in charge of a company’s computer engineering team, working to design software that’s unique to the company and its needs. These professionals make about $88,0004 annually. Software Developer: If you love being creative and solving problems, you could work as a software developer to create computer applications of all kinds, from games to databases to sales tracking. These experts make approximately $78,0005 per year. IT Security Consultant: You can use your technological skills to keep companies’ and clients’ devices safe as an IT security consultant, a role in which you’ll build and oversee a business’s information technology security systems. In this role, you’d make around $80,0006. It’s clear that entering the world of information technology holds plenty of potential opportunities and adventures – and if you’re ready to explore all that’s waiting for you, there’s just one credential you need to get started. With an IT degree, you can start a new career and gain a world of knowledge and skills that will be beneficial for years to come. 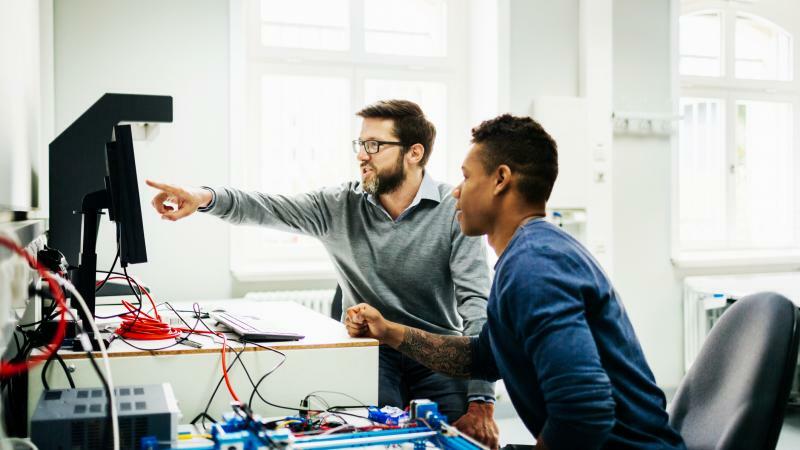 The world depends on technology, and with an IT degree you could be a pivotal part of technology’s advances and successes. So, in order to earn your degree, you need to do a little research. You should first look for colleges that offer two things: IT degrees and online programs. In your search, it’s important to look for IT degrees that can be completed entirely online. And don’t forget to consider tuition prices. If you take the time to search for these programs, you’ll find them – and you won’t have to break the bank to earn your degree in IT. 1 EdSmart.org, 10 Most Affordable Accredited Online Colleges 2 Illinois Online, 5 Benefits of Studying Online 3 My College Guide, What Can You Do with an Information Technology Degree? 4 My College Guide, What Can You Do with an Information Technology Degree? 5 My College Guide, What Can You Do with an Information Technology Degree? 6 My College Guide, What Can You Do with an Information Technology Degree?